Hello friends! Welcome to another Stampin’ Up! Artisan Design Team blog hop. In this hop we are featuring products from the Snowflake Showcase promotion that was just announced on October 1. Have you seen these products yer? There are two stamps sets in this promotion and half of the Artisans are featuring one, and half are featuring the other. Snow is Glistening is the stamp set I was to happy to play with for this round. This is a beautifully detailed stamp set with an intricate tree, snowflakes and falling snow texture pieces. We were asked to create at least one project only using the stamp set and then one project using the stamp set and the dies. Mission accomplished. I can’t wait to share my makes with you. But first, some ordering information … Stampin’ Up! demonstrators can preorder the Snowflake Showcase products (now) October 1–31, 2018 and all customers can begin ordering November 1–30, 2018. All items are offered while supplies last. All right, ready to look at cards? This JOY card featured the detailed tree from the Snow is Glistening stamp set and the ornate swirl snowflake die from the Snowfall Thinlets. The tree has been heat embossed with Whisper White embossing powder. I love how this set looks heat embossed, it feels so elegant. I used the swirl snowflake die to cut out a piece of the Velvet paper to run across the tree. This paper has such a soft beautiful texture. I really had a hard time showing how awesome the Velvet paper is in photos but it’s a beautiful, soft, white and velvety, and it will make people want to touch your cards! Included in this promotion are: the Snow is Glistening Stamp set, Happiness Surrounds Stamp set, Snowflake Trinkets, White Velvet Paper and the Snowfall Thinlets. Check out the flyer at the end of this post for more information, including how to order. 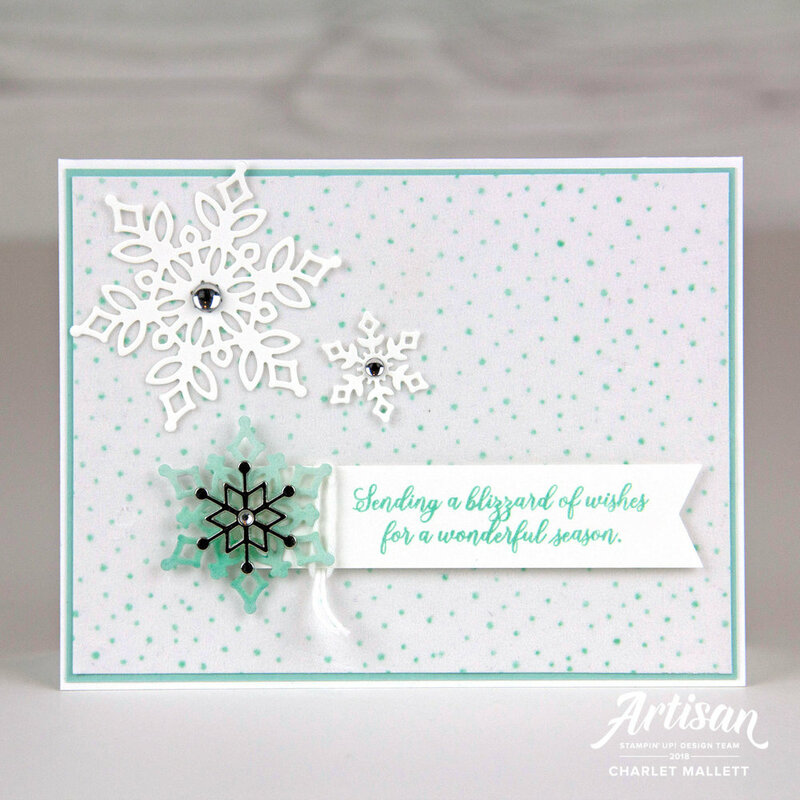 This next card features only the Snow is Glistening stamp set. I’ve stamped the snowflakes in this set in Versamark onto Glossy White cardstock and then heat set with Whisper White emboss powder. I love the look of pink, blue and white for holiday cards - it’s a fresh color combo but still feels festive. I blended Blushing Bride ink into Pool Party ink onto the embossed cardstock using a sponge. Such a cool look. I accented the stamped snowflakes with a couple of Snowflake trinkets. The greeting has been stamped and heat set on the Vellum. Here I preferred to stitch the vellum onto my cards instead of glueing so I didn’t have to hide glue marks. BONUS! I have two additional cards to share with you. This next cards features stamping directly onto the White Velvet paper. It’s holds a stamped images remarkably well for being so soft and fuzzy. I also dyed the paper as you can see shown on the Pool Party snowflake. I wet the paper throughout and then dipped one end of the snowflake into the ink to soak up the Pool Party ink. This last card features the snowfall border image. This image is super easy to repeat using the Stamparatus. The image is perfectly sized to use with the hinge step. Thank you for spending a minute with me. I hope you've found some inspiration to help you in your crafting. Up next is fellow artisan, Connie Collins. She always WOWs me with her creations and this time is no different, her take using the Happiness Surrounds stamp set is a MUST SEE. Thanks again! I appreciate YOU and all of your lovely comments. Have a great day! (16) chosen by Stampin' Up! to create exclusive projects for the company. with us by clicking on our blog homepage links below.